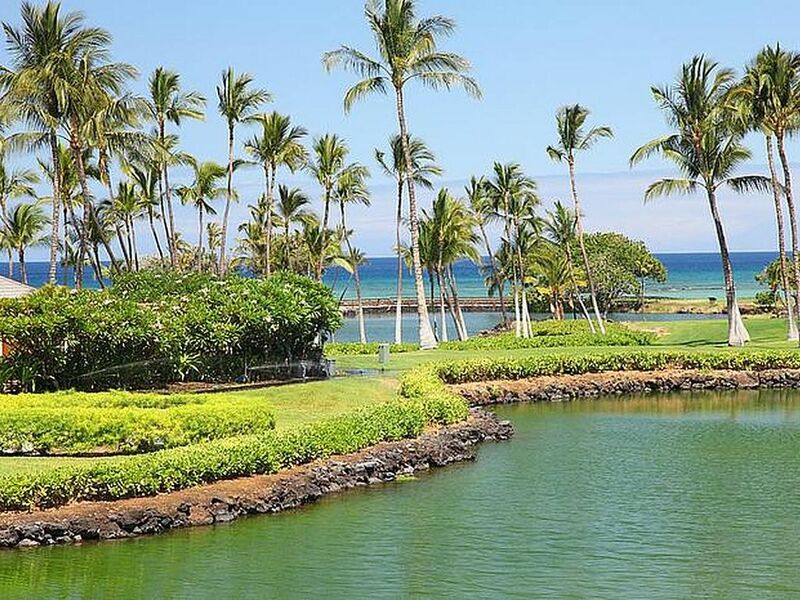 Mauna Lani Terrace E201 offers a nice ocean view out over the ponds. This one bedroom villa has been nicely upgraded to include granite counters and stone floors. The living area has a sleeper sofa with two chairs that faces a LCD television and looks out over the ocean view. Adjacent is the dining area that seats 4. The kitchen is well equipped and has granite counters and upgraded appliances. Step out of the living room onto the lanai and enjoy a dining area for four and a wet bar all overlooking the ocean view. The master bedroom has a king size bed with bedside tables facing a chest of drawers with a LCD television. There is an attached lanai with a lounging area overlooking the view. The attached bath has dual vanities with a walk in shower. We had a great stay at the Terrace and will definitely be coming back again. Loved the wonderful view of the fish pond. The property is so serene and well cared for and the concierge service was really helpful. The only issue we found difficult was using the cable tv. The cable box and remote do not appear to be fully synced. We needed assistance with its operation but finally figured it out. I will recommend this property to all of my friends. Mahalo. 7th night free during the regular season.